Villa d'Este totals 152 rooms. The main house built in 1568 and known as the Cardinal's building counts 125 rooms while the trompe l'oeil masterpiece known as the Queen's Pavilion, inaugurated in 1860 has 27 rooms. 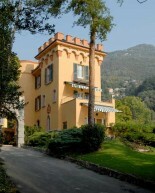 In 1873 the two Villas combined into one property and became Villa d'Este. Every air conditioned room is different both in size and décor no expense has been spared in the decoration of the interior of the hotel. For more information on the rooms see the side menu. 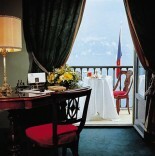 Villa d’Este is located on the shores of Lake Como at Via Regina, 40 - 22012 Cernobbio – Italy. Its location is approximately 45 to 60 minutes from Milan the nearest city. Guests can reach the hotel by private transfer, train or by helicopter. The hotel has its own helipad. Please ask your resort World consultant for further details. Luxury Hotel Villa d’Este is located on the shores of Lake Como in Italy is just 45 minutes from Milan and 35 minutes from Fiera Milano Rho. Built in 1568 as a private mansion and converted to a hotel in 1873 this luxurious estate has a wonderful history to complement its expansive grounds and lavish period interiors. Villa d Este celebrates the magnificent bygone era from which it was originally designed and built, without sacrificing a single modern day convenience. Villa d'Este totals 152 rooms. The main house built in 1568 and known as the Cardinal's building counts 125 rooms while the trompe l'oeil masterpiece known as the Queen's Pavilion, inaugurated in 1860 has 27 rooms. All rooms are decorated with period furniture and no expense has been spared. Antique furniture, oil paintings and the finest linens and silks are what you can expect to find in every room. Surrounded by a 25 acre park, this fabulous property is more than just a hotel. The opulent beauty of its past years remains intact and guests are invited to leave their troubles behind upon entering the hotel and let the attentive staff pamper and cater to them in a fashion fit for royalty. With an abundant choice of first class dining experiences guests will never go hungry or grow tired with the menu on offer. Meals are available to be served just about anywhere in the grounds but the hotel does have three superb restaurants offering various styles of cuisine as well as some bars and even a disco. As well as the superb dining the hotel offers a vast array of world class facilities and activities to keep active clientele busy throughout their stay. Villa D’Este is one of the world’s most famous grand hotels, and deservedly so. It’s is the sort of place dedicated travelers must make an effort to see as it is off the traditional Italian holiday path, but once the effort is made the lucky traveler will not be disappointed. This is a place where the luxury and quality of a past era can be appreciated. Villa D’Este is a unique and special place and like no other hotel in the world. 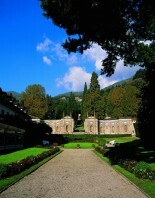 There are an abundance of things to do at Villa d Este. A spectacular jogging course is popular for those guests who like to keep fit. Tennis, waterskiing, sailing on Lake Como, windsurfing, canoeing, squash, indoor golf, fully equipped state of the art gym, putting green and a sauna and Turkish bath to relax and rejuvenate are just some of the activities available at this luxurious resort. Villa d'Este world class beauty center and spa is designed to make artful use of the blend of light, color and water to create the proper environment for serenity and relaxation based on Zen philosophy. If it’s golf you are after there is a beautiful 18-hole park land course designed by Peter Gannon close by which winds its way through chestnut, ash and pine trees sheltering golfers even from the intense August heat. Villa d'Este is considered one of the most challenging and difficult par 69's in Europe, even though it is the site of several amateur competitions each year. The club house overlooks several holes and a spacious view of the Montorfano Lake.